Original image captured by Chris Martin wildlife photography in the Kruger national Park. This is a popular subject to include in a series of bird paintings, and for good reason. 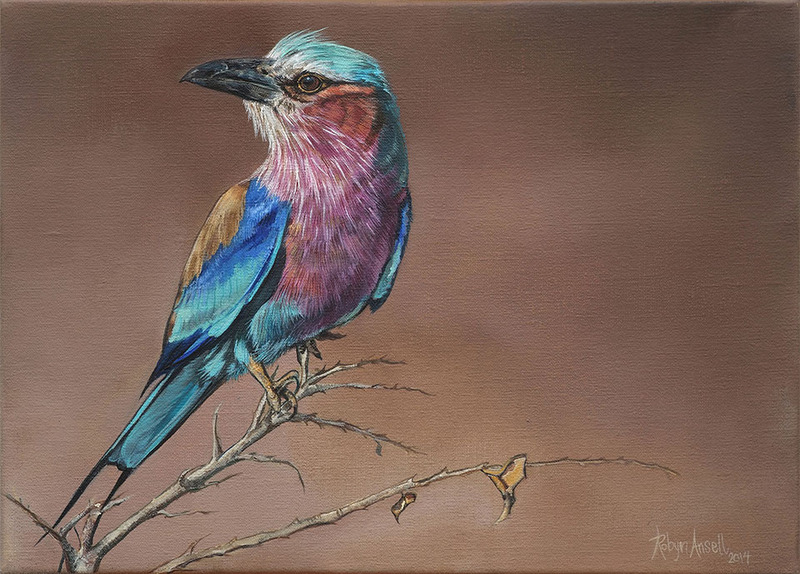 Seeing these common bushveld residents in their natural habitat would inspire creative tendencies in any artist whose eye is drawn to colour. It is always a treat to observe them as they go about their daily activities, their almost unrealistically bright colouration so beautifully contrasted against the soft dry tones of the savannah lands they inhabit. I am always attracted to the fine details in an image and so the delicate feather work was a huge draw factor in this particular work. It was fun to work with such bright colour tones as a huge part of the enjoyment of the painting process for me is the actual practice of mixing up tones in the pallet. I was also drawn to the composition of this image, I love the simplicity of the branch on which he is perched, added detail of things such as the withered leaf and the fine scratches on the roller’s bill were what made this picture such joy to paint.